Complimenting the existing Victron Multiplus range, the new 500VA version is ideal for small lighting and remote equipment installations. Despite being small, the 500VA Multi combines a powerful true sine-wave inverter and advanced adaptive charger with a a high-speed AC transfer switch (12-millisecond changeover time). The Multi 500VA is a powerful true sine wave inverter, a sophisticated battery charger that features adaptive charge technology and a high-speed AC transfer switch in a single compact enclosure. The full bridge plus toroidal transformer topology has proven its reliability over many years. The inverter is short circuit proof and protected against overheating, whether due to overload or high ambient temperature. Needed to start high inrush loads such as power converters for LED lamps, halogen lamps or electric tools. When Search Mode is ‘on’, the power consumption of the inverter in no-load operation is decreased by approx. 70%. 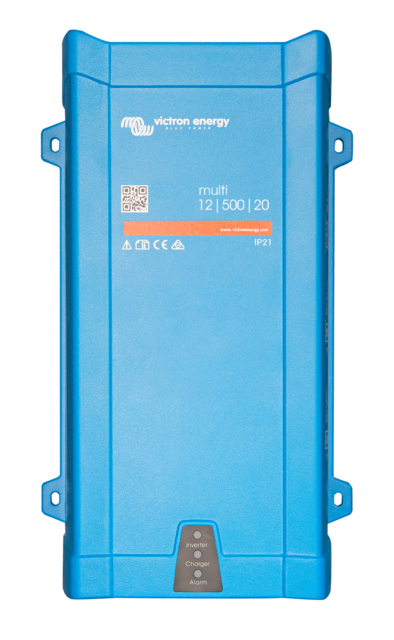 In this mode the Multi, when operating in inverter mode, is switched off in case of no load or very low load, and switches on every two seconds for a short period. If the output current exceeds a set level, the inverter will continue to operate. If not, the inverter will shut down again. By default, the programmable relay is set as an alarm relay, i.e. the relay will de-energise in the event of an alarm or a pre-alarm (inverter almost too hot, ripple on the input almost too high, battery voltage almost too low). Remote operation can be implemented by connecting a switch to the three pole connector.